Croatia has a beautiful and well-indented coast line with thousands of islands, reefs and bays to explore. Croatia's extraordinary island-speckled coastline is indisputably its main attraction. The first thing that strikes you is the clarity of the water. When it's set against a dazzling white pebbly beach, it sparkles with a jewel-like intensity in shades of emerald and sapphire. There are long sandy and shingly stretches too – perfect for lazy days spent lounging or indulging in a quick dip after a long ride. Discover the numerous romantic ruins, charming hills, countless natural beauties and phenomena are waiting for you. If you would like to experience the region of South Dalmatia thoroughly, not wanting to do without Dubrovnik, this sail and bike trip would be an excellent choice. Using our charming, floating accommodation, you will get to know this sparsely populated part of Croatia including the islands of Sipan, Korcula, Hvar, Mljet, Vis, Lastovo and Peljesac. 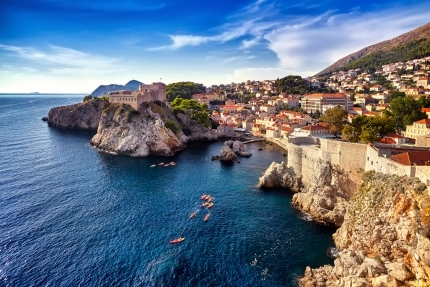 The highlight of the trip is the town centre of Dubrovnik that is listed on UNESCO’s world heritage list with its imposing city wall and its narrow alleys.